Last evening, our Board of Trustees hosted a whanau evening for our Maori families. 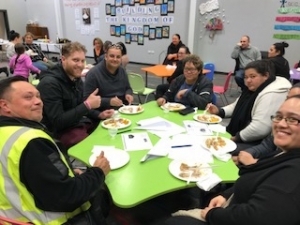 It was a great get together and we are grateful for the wonderful attendance by our families who took time to get to know each other, make connections, play games with the children and enjoy the hangi dinner. We look forward to being with our whanau community again later in the year and to working together to meet the needs of our tamariki. This is an important part of our school actioning the principles of the Treaty of Waitangi and we value the support of our Board of Trustees, staff and whanau in enabling this to happen with manaakitia/respect and ngākau pono/integrity. Thank you to Maria Speechlay and her husband, Paul, who along with Anna Soo Choon (BoT member) worked tirelessly to prepare the kai in the steam cooker for our dinner. Thank you to the children who also provided “helping hands” during the day! Last night we had a wonderful Whānaungatanga gathering in Taamaua with our Maori whānau, sharing kai and getting to know one another. Earlier on in the day children were eager to prepare things for the hāngī, peeling vegetables, shredding bread into pieces and frying onions to make the stuffing which was a highlight of the menu. Hearing the children telling their parents about which part of the meal they helped to make made it a very special evening. 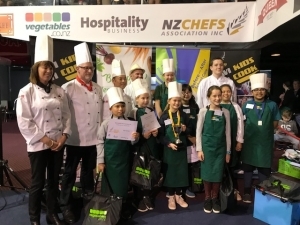 We congratulate Matthew Cortez from Learning Community Maunga for outstanding success in the NZ National Kiwi Kids Can Cook 2018 Finals Competition. Matt won third place in the Championship Finals – an amazing achievement! 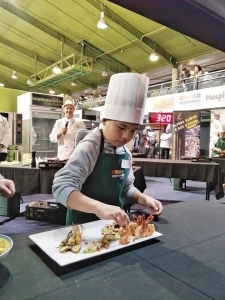 This was Matt’s 3rd time at preparing and cooking dishes as part of the local, regional and then national finals. The event was organised by the NZ Chefs Association so Matt’s dishes were judged by these Chefs. His first dish was Shrimp and Scallops with pea puree and was so incredible, it won Matt a place in the Championship round where Matt cooked Baked Salmon with crispy skin and mango avocado salsa. This was the tasty dish that won Matt 3rd place in the overall competition. Well Done Matt – a wonderful example of hiranga/excellence – we are so proud of you! Community/Parish Event – Family Night! 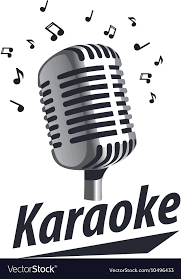 St Mary’s Parish, Papakura are holding a FAMILY KARAOKE Night on Saturday 22nd September 6pm – 11pm in Taamaua/our school Hall! The theme is 70s, 80s and 90s. There is a gold coin donation entry with entertainment throughout the night … spot prizes … food stalls … raffles … (no alcohol is permitted). All funds raised will go towards the Parish Pilgrimage to Motuti in early 2019. DO come along and have a fun night out with your family! Further information about the Pilgrimage is in the Community Events section of this newsletter. 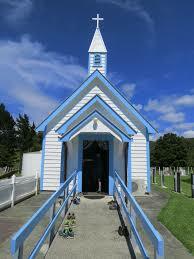 On Friday 31st August we’ll be having a special Liturgy in Taamaua (Hall) to celebrate Father’s Day. 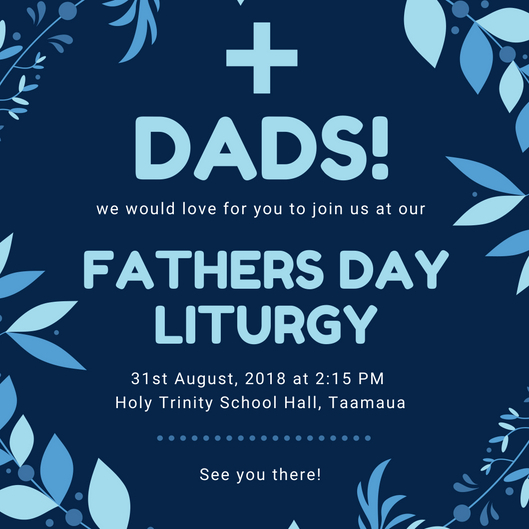 We warmly welcome all our Holy Trinity whanau to join us on this celebration, especially our dads, grand-dads and father figures as this special occasion celebrates you! Patrick Dunn Whanau House will be leading this Liturgy and it’ll be a great way to end the week! See you there! Last year we had a successful Mufti Mania which we fundraised for Nawi school in Fiji. This year we’ll be having Mufti Mania on Friday 7 September along with a gold coin donation. Caritas Aotearoa and the New Zealand Catholic Primary Principals Association (NZCPPA) have teamed up this year to run a Mufti Mania across all New Zealand Catholic Primary schools to fundraise for Apifo’ou College in Nuku’alofa, Tonga. Apifo’ou College was almost completely destroyed by Cyclone Gita in February and all proceeds will go towards rebuilding school classrooms and labs as well as restoring some of the teaching resources that were lost. The theme for the Mufti Mania is TONGA! Tongan colours (red and white) or Tongan traditional wear. This year our Social Justice Week commences on Sunday 9 September to Saturday 15 September. The theme for Social Justice this year is “Enabling Communities: Everyone has a part to play”. Our school will be participating in different activities that are based around our new concept learning this term – SERVICE! 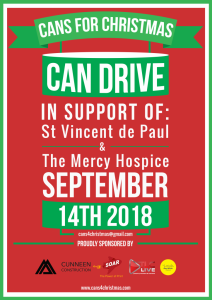 Some of our students will be visiting Lady Elizabeth Rest Home to share our gifts and talents and we’ll also be running a Can Drive during the week. Each Whanau/House group will collect and bring in as many “canned” food tins throughout the week as they can. These will be given to St Vincent de Paul and the Auckland Mercy Hospice. They will in turn distribute them to Auckland families who need food support. Mr Williams will be dying his hair the colour of the winning house – MacKillop Whanau (RED), Patrick Dunn Whanau (GOLD), Aubert Whanau (GREEN) and Pompallier Whanau (PURPLE)! On Monday the 27th of August, we have a travelling production company: The Playhouse Theatre, coming in to perform a special drama with us. 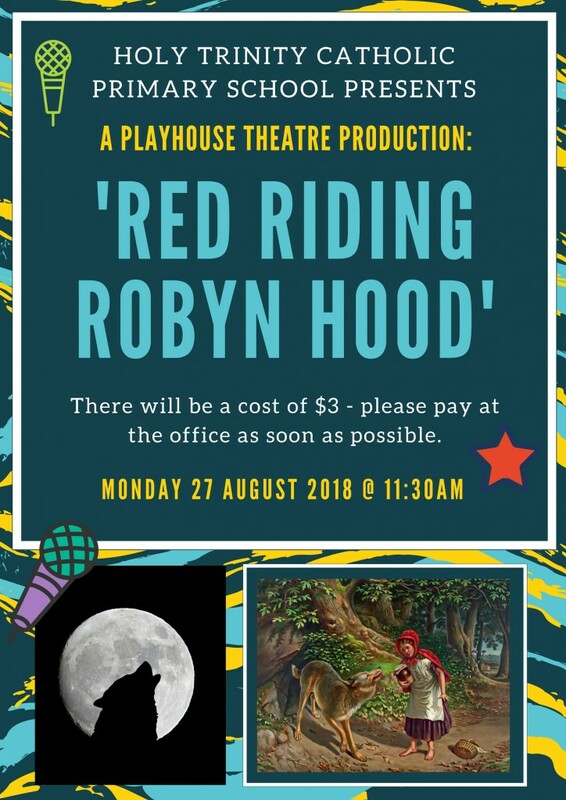 ‘Red Riding Robyn Hood.’ More information can be found here. Our concept learning this term includes a large Arts focus (dance, drama, music, visual art) and sharing our stories with others. This production is a great way for students to see a professional drama performance. We will be focussing on the Gospel Values of Excellence – giving our best and Unity – participating in the school community. The cost for students will be $3 – please pay at the office as soon as possible. 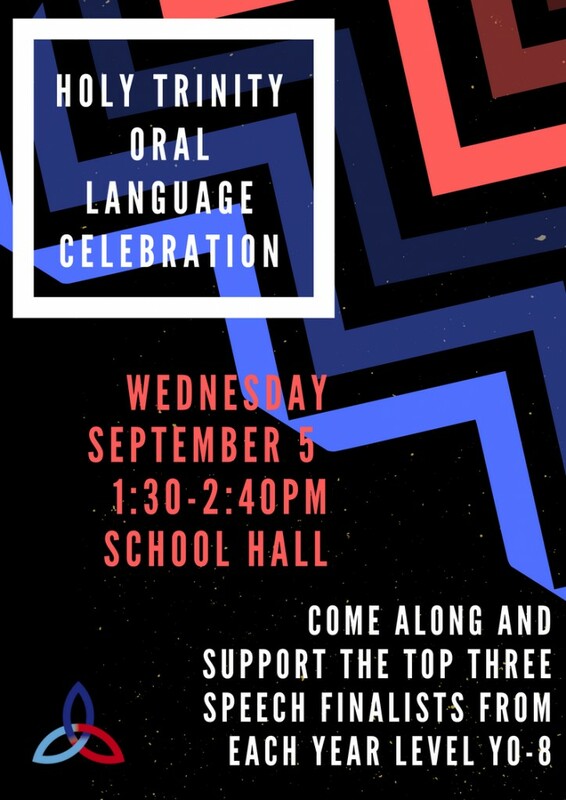 On Wednesday, 5th September (a change to the original date of Tues 28th Aug) we will be holding an Oral Language Celebration (Speech finals). The event will begin at 1:30pm and run through until the end of the day. After presenting to their Learning Communities, three students from each Year Level will be chosen to share their oral language speech skills with the whole school community. Many thanks to our parent community for your support with the Industrial Action taken by the teachers and principals union members last week. We are grateful for the supportive comments and shared views and for the positive way in which you organised alternative arrangements for your children whilst school was closed on the Strike Day. This allowed our union members to attend the organised marches in the city and to contribute to being a “voice” to the government about our concerns for our children and education in this current climate of staffing shortages, the need for resources for additional learning support and the issues of recruitment and retention of teaching personnel. 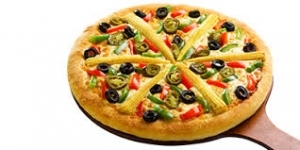 Pizza Lunch – Friday 31st August 1:00pm! A notice has been distributed via Linc-Ed plus students will be bringing home a hard copy today re: ordering of slices of pizza for Pizza Lunch day. All orders and payment need to be in by Wednesday 29th August. Please order through the school office. School DISCO – Friday 21st September 6:30pm – 8:00pm in Taamaua/Hall! A notice will be distributed via Linc-Ed – save the date for this very fun event! Monthly PTFA Meeting to be held Thursday 6th September 7:00pm in the staffroom. ALL WELCOME! School Carparking – TAKE CARE! 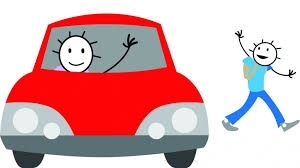 We are having difficulty with parents parking unsafely in the school carpark during the afternoon pick ups from school. PLEASE only park in a designated carpark. The painted pedestrian crossings must be kept clear at all times as we need the children to be able to cross in safety. As part of Health and Safety, our Board of Trustees members are required to monitor the car-park from time to time and may speak with you if there is a problem. Thank you for your patience and understanding. The school pathway to Kuaka Drive entrance/exit is NOW OPEN! This is a great alternative for families who live near Bruce Pulman Park or who want the safety of parking in a quieter traffic zone. The inner fence gate will be open from 8:15am each morning and closed again from 3:15pm each afternoon. The black fence gate near the Kuaka Drive entrance is on a latch that just needs to be lifted to open or shut – the gate will not be locked at this stage. 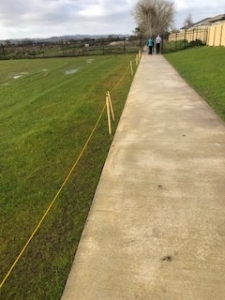 Please walk with your child/children on the pathway ONLY as the school fields are still under development and are not suitable for use. Whenua have written some wonderful prayers and artwork that reflect their learning about Mary in the Communion of Saints strand. As a Church, one of the ways we honour Mary, the greatest of Saints, is as the Mother of Jesus. The children have being able to draw on their relationship and experience with their own mothers to help them understand how special Mary is to Jesus and for us too. 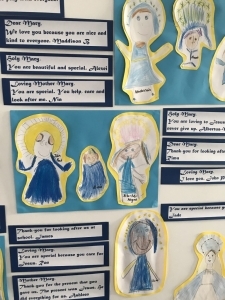 You are welcome to please come through the school office and read the children’s prayers asking Mary to pray for us and look at their lovely drawings of Mary. 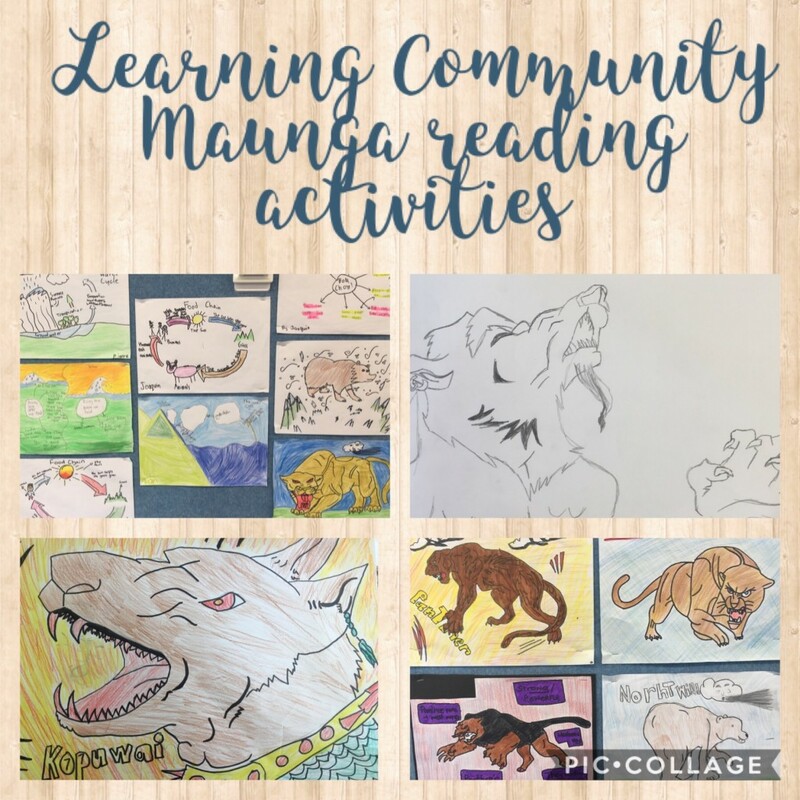 Lately, Learning Community Maunga has been working hard to learn a variety of strategies in Literacy like predicting, inferring and visualising. Here are some of our visualisations – we read a story and then created illustrations to show what we were visualising while reading. 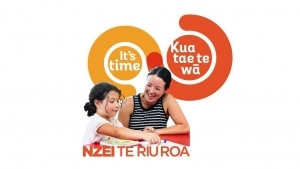 Kia kaha LC Maunga students – keep up the great reading learning! We had a wonderful day at our school cross country. The rain held off, everyone ran their hardest and was cheering on positively. We have a shared photo album here that you can add to or take photos from. 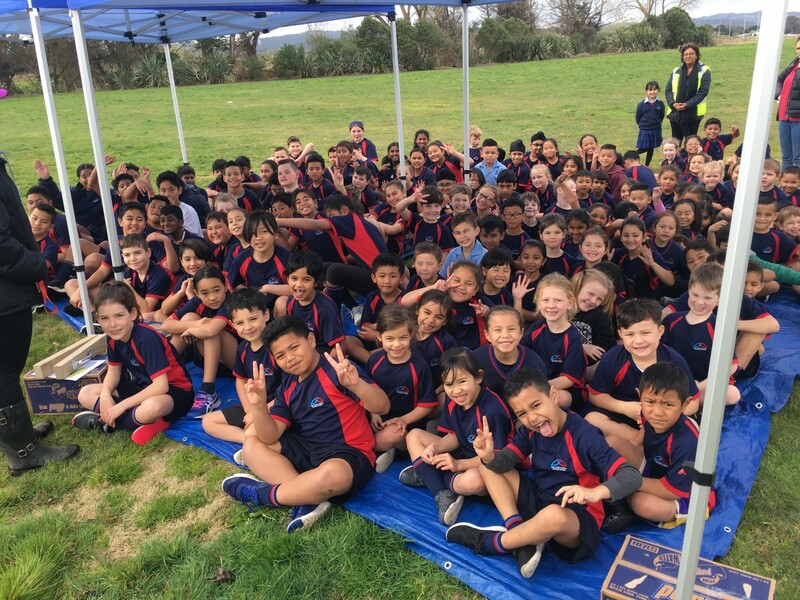 A huge thank you to the whānau who set up the sausage sizzle and stood out on the course as marshals, David Kenyon, along with Coca-Cola, for sponsoring a water for each student and all the Holy Trinity staff who helped out in various roles on the day. These are great community days that we can all take part in so thank you for supporting the school and coming along to cheer on our students. 1st, 2nd and 3rd place certificates will be handed out at our Monday morning assembly/liturgy. Sports News with Noah and Eva! Last week, we had the privilege of attending the Stephen Adams Basketball Camp. Stephen Adams IS a famous NBA Basketball player. He plays for Thunder and Oklahoma Basketball Teams in the USA but more important Stephen is a KIWI! He was back in New Zealand to share his talent with KIWI KIDS! We were so lucky to be at the camp with him. He was funny, humble, friendly and VERY VERY VERY TALL! He took us through some attack and defence drills, showed us how to pass and shoot properly and took us through some exercises to loosen up, warm up and the warm down. One thing I will remember of this amazing experience is what Stephen Adams said to me … “see you in the NBA!” (Noah) and “chase your dreams, never give up!” (Eva). He said if you fail, “Never give up because the F stands for FIRST then A stands for ATTEMPT and the I stands for IN and the L stands for LIFE – FIRST ATTEMPT in LIFE”. 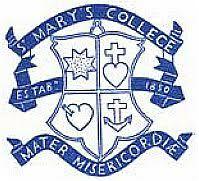 St Mary’s College is committed to ensuring the smooth transition of new students from your school into our College for 2019. Our Orientation Morning will be held on Wednesday 28 November 2016 – 9.00am – 12.00pm. The details of students attending from your school will be forwarded to you in late October. It is important for students to attend this morning in order to facilitate an easier entry into a secondary school system . This is why we are informing you in advance as we know that time of the year can be busy with end of year activities. Copyright © 2016 Holy Trinity Catholic Primary School. All rights Reserved.